In the social media world, the community manager does more than merely tweet. Isitedesign.com explained how the community manager is driving the future of social media marketing. 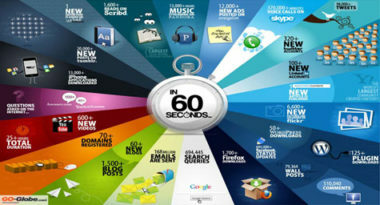 As the graphic shows, every 60 seconds there is a huge amount of content being created and shared. The enormous availability and accessibility of this content is extremely useful for brands because it lets them identify trends, collect relevant information, and develop more meaningful customer experiences. Driving the creation of this content is the community manager, whose role is to continually interact with consumers to stimulate the ongoing production of this valuable information. While it’s important for brands to have followers, more essential is providing them with a compelling reason to follow and fostering the innate desire to participate regularly in the brand’s community. That’s considered the true measure of social media marketing success, and that’s the community manager’s role and goal in the social media stratosphere. “This really highlights the differences and long-term benefits of social media. With an effective community manager, we can engage our audience, motivate their participation, and ultimately earn their loyalty. That’s the difference between having a conversation with your community versus broadcasting to them,” says Jeff Cohen, director of social media at MDG Advertising. To discover social media marketing strategies that will increase your connection with consumers, contact MDG Advertising.